Three years ago I bought a video made by Don Demers that concentrated on “Marine Painting: Art of the Wave.” Don, a premier master artist of marine paintings, has some of the most extraordinary wave paintings I’ve seen by any contemporary painter in my time and it doesn’t surprise me of the sheer number of awards he has won. When I saw that Mr. Demers produced a video I didn’t hesitate to purchase because I wanted to get better painting the sea, but also to gain an understanding of his thinking as he painted waves. My first viewing of the video I put it down (for three years – this guy was too intense for a new artist like myself), he knew the sea but was too advanced for my understanding (being able to interpret oil painting vs. oil pastels, mixing colors, and brush techniques). 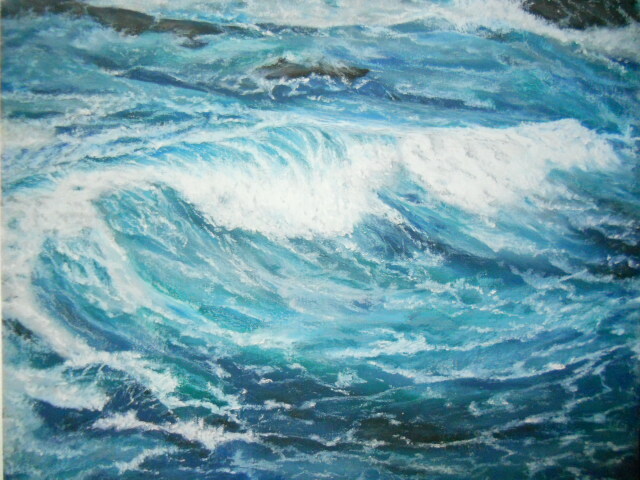 This past week I picked up the video again to see if I could follow along, now that I’m painting the sea in acrylics. I watched the video with new eyes and understanding, and decided to attempt to paint along. 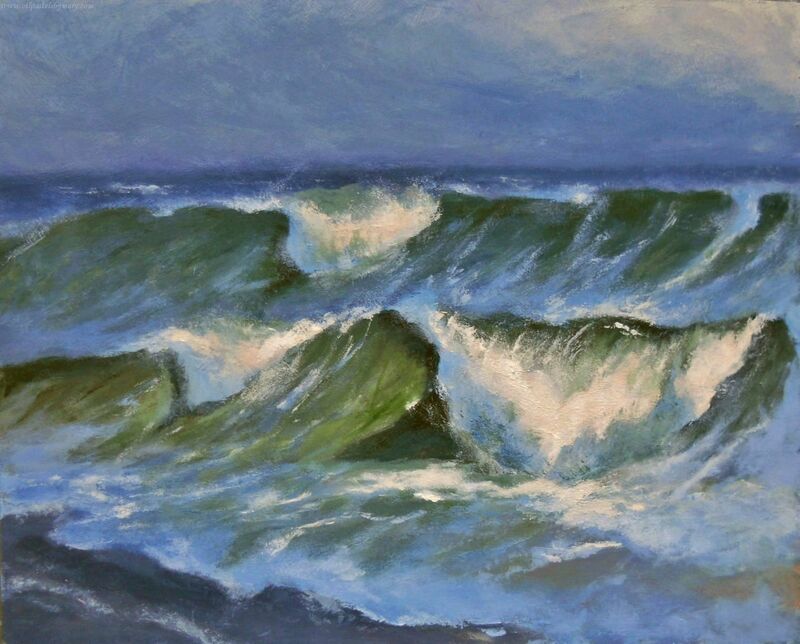 My painting doesn’t match Mr. Demers’ (medium, colors and technical know-how), but the lessons learned were invaluable for the thought process, steps in building a wave, mixing colors and distinguishing shadows and light within sea-foam. Here is my study. While there are areas to be re-worked, it’s a study not of perfection but for learning how to paint a better wave – click onto the image for a larger view of the details. This entry was posted in Acrylic Paintings. Bookmark the permalink. Wonderful progress since I last saw this. Thanks Frank. I haven’t painted the scene before, but appreciate your feedback! Love the colors, shadows, and light of this painting. Truly a beautiful painting, Mary! Thanks Amy, was a great learning experience in painting the scene. I can feel the movement of the waves! Mary, you have produced a powerful painting, full of verve and vivacity and luminosity. I always love your seascapes that lure me into their magical movement. Great to see you again Patricia, thank you so much for your generous reaction to this painting – I really enjoyed reading it. It was my intent to capture the energy and luminosity, very cool that you read this into the scene. Thanks Patricia!! You are so welcome,Mary. It’s a scintillating painting. All your seascapes are filled with power and beauty. I love them. This painting makes me wanna go swimming and ride the waves! Hi Pauline, thank you for your thoughts and artistic eye with the painting. Love your reaction to the sunlight because that’s exactly what was intended, the sunlight hitting that one area. Working hard to develop a sense for mixing colors, especially the greens – thanks for noticing it’s coming along. Thank you Rhonda so much, I learned a lot from the video and experience of following along especially with light and shadows. His thought process helped me resolved some painting issues with the sea that I had and hopefully I’ll be able to carry through future sea paintings. Really appreciate your feedback, have a great weekend. You are an amazing blogging friend Madhu, thanks so much! Thank you Marina – it was a great scene to learn from. I really enjoyed this experience and can see how the instruction will stay with me when I paint another wave scene. Appreciate your encouragement and enthusiastic response my friend. Looks like someone was paying attention in class. Beautiful, Mary! Thanks Jill – he’s an awesome artist to learn from. Woo! Yes, I checked. I have goosebumps! This is a powerful, free, smashing and crashing work of art right here. Thank you for the beautiful wake up and celebration of the ocean, Mary! Well done!! Thanks Laura – glad you enjoyed the ocean scene! I like how you described your reaction to the piece! I felt like I was watching the rough surf! Very cool! You have prepared yourself for the advanced techniques.. and it shows! Great work, Mary.. I can feel the power of the waves! Thank you Rose, appreciate your compliment and feedback! I think your waves are marvellous Mary. The curl and the fall of the water is so well done and it certainly is how I have come to experience waves. I think a touch, not too much, of more translucency will make it pop even more, but that’s just something I perceive. Really good. Thanks so much Don – love reading your assessment. Thank you for your suggestion on the translucency – something I must get much better at. There was a bit more of it in the foreground wave and build-up to the right, but at the last minute as I was laying and scrubbing in sea-foam spindles/trails I decided I didn’t like the way they looked – change them and ended up loosing the little translucency I had. Then I couldn’t get it back as the area got a bit muddy. It’s a subject that I’m going to have to work on with more focus and practice. Great feedback thanks! You know Mary I feel, rightly or wrongly so, in many sea scapes artists tend to go over the top with translucency and it looks almost unnatural. It kind of becomes a gimmick. But yours are robust with a power and a strength and a degree opacity that is real. Don I can’t thank you enough for your generous compliment. I understand what you are eluding too and I’ve been trying really hard to create as natural an environment that I’m able too at my level. Thank you for your sound advice and interest, means a lot. Thank you so much Derrick for your generous comment. http://www.donalddemers.com – you will love his work. Hi Janet, thank you! It’s been a real joy to learn acrylics – can’t tell you how liberating they are in painting the sea. Still much to learn by way of technicals and color mixing, but I’m in a comfortable place and that tells me I made a good choice by switching up my medium. Hello Fabio, thanks very much. It took a while to develop the sky, I’m still working on how to develop a sky with a brush – thanks for noticing. I so admire your dedication to your art – and the hard work of making art. Beautifully done, Mary. Thank you Audrey – I really appreciate your kind thoughts and words. How very exciting, Mary, for you to have advanced in your art to now comprehend the video. 🙂 Lovely painting. Thanks you Jet – it was a big deal for me. He really overwhelmed me the first time I saw the video, I could feel his intensity coming through as he was speaking and painting – I really had to back away. But this time when I watched I was ready. Thank you, means a lot. Your waves seem to be getting more wild and free with each study…. Thanks Cynthia – this was a very good learning session. The more I do of these scenes, I feel freer to stretch and not be intimated by capturing the movement. It’s beautiful, Mary. You have a way with water! Thank you Cynthia – really appreciate it! Thanks Sylvia, as Don said it’s all about the barrel of the wave – hopefully I’ve made a few surfers happy! Sounds like you had a great lesson. Let me rephrase! It looks like you had a great lesson. Thanks Resa, I learned a lot from studying his work and his video – amazing when an accomplished artist gives back to those of us just starting out, so we might learn through their own experiences.